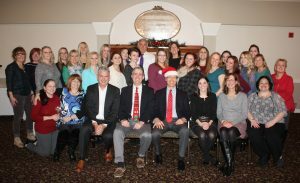 It’s very rare to see a dental office that boasts 10 employees with more than 20 years of experience with the same team of dentists, dental hygienists, dental assistants, patient advocates and receptionists. At McCarl Dental Group, Spring 2016 marked three 20 year anniversaries for our team members Fran Lawrence, Christine Stovenour, and Rachel Heineman. Next time you visit, make sure to thank them for their years of dedication. Contact our dedicated dentist and team to schedule an appointment today. Fran started as a part-time receptionist with our Greenbelt practice, but she quickly took on more responsibility. She is currently our full-time Patient Advocate and Treatment and Financing Coordinator. She has years of experience helping our patients fully understand their treatment options, dental insurance coverage, and our financing policies. Patients love working with this kind, knowledgeable team member to review their dental care plan and review options for financial arrangements before starting treatment. Additionally, Fran serves as our office liaison to technical support. She keeps the office computers running smoothly, and allows us to seamlessly integrate new technologies like our iTero digital impression system. Fran is the proud mother of 5 children and grandmother to 8 grandchildren. She is very dedicated to her work and family. Christine offers our patients so much more than just excellent dental hygiene treatment. She is also an exceptionally kind and caring individual who truly dedicates herself to helping patients achieve their smile goals. Christine started at the Greenbelt practice as a dental assistant at the age of 16! Her older sister, Rachel (also celebrating 20 years with our team) recommended her for the position. After working with our team for a few years, Christine decided she wanted to pursue a career as a dental hygienist. Continuing to work full time on our team, Christine completed the necessary course work to become a hygienist, and her transition into that position on our team was very smooth. Christine regularly completes continuing education in a number of areas, but she is especially passionate about the effects of nutrition on oral and overall health. Christine is a joy to work with, and our patients and team alike enjoy working with this skilled, dedicated team member. We are extremely lucky to have had three sisters working in our practice. Christine and Rachel both celebrate 20th anniversaries, and their sister Emily also worked with McCarl Dental Group. Rachel brings a number of skills and talents to the practice that we appreciate greatly, but possibly her most important asset is her ability work closely with patients offering compassionate care and understanding. Highly intelligent and detail oriented, Rachel loves helping patients at both our Greenbelt and Shipley’s Choice offices understand their treatment planning, insurance coverage, and other administrative details that can cause unnecessary stress for many patients. In addition to offering superior dental services, Rachel also enjoys photography especially photographing families and our dental team. She also enjoys reading classic literature and spending time with her husband, Pete and their two beautiful children.